Upon the status of our favorite game. This month, the new printing of Moop's Monster Mashup (in the Deluxe-style packaging) and Munchkin Apocalypse: Judge Dredd will make their way to store shelves. If your store doesn't already know you want these games, be sure to tell them so they can plan to have plenty on hand! Speaking of plenty of games, when we looked at our end-of-year numbers, we realized that we needed to schedule some reprints. Expect a whole bunch of reprints in June and then several more through the second half of the year. We don't want anyone to go to bed deprived of Munchkin! Alain Dawson has been working hard with USAopoly on a couple of their 2017 releases, and I think y'all will be super stoked to find out what they are! . . . but we aren't quiiiiiiite ready to make that announcement. Keep refreshing! 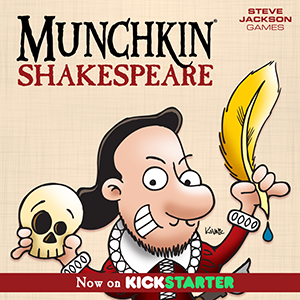 The Munchkin Collectible Card Game is making good progress under Devin Lewis' stewardship. We spent a week bashing on the rules to make sure they said exactly what we wanted them to say. Sam and Sabrina have been plugging away at the packaging for the POP displays and the individual sets and boosters, and I love what they've come up with. Best of all, Eric Lang and Kevin Wilson already submitted their draft of the cards for the first expansion wave, and we're poring over those before setting up the next round of Austin-based playtests. We are so excited about getting more information to y'all about this great new game, just as soon as we're confident in our release date! That's enough for this month . . . I have to get back to watching over my Kickstarter! See you in March!